Good Morning, this is Capital Essence’s Market Outlook (the technical analysis of financial markets) for Wednesday November 8, 2017. We’ve noted in the previous Market Outlook that: “daily chart of the S&P has shown significant signs that momentum is waning. Over the near to intermediate term the technical suggested that breakouts will not sustain.” As anticipated, the S&P closed lower Tuesday, slid less than 0.1 percent to 2,590.64, as investors turned their attention to fiscal policy, with tax writers from the House of Representatives expected to hammer out their plan this week. The Nasdaq composite fell 0.4 percent to close at 6,767.78. The Dow Jones industrial average, meanwhile, rose 0.04 percent to close at 23,557.23. The CBOE Volatility Index (VIX), widely considered the best gauge of fear in the market, rose 5.21 percent to close at 9.89. One of the more noteworthy developments in recent days has been the move in frontier markets, which were among the world’s worst performers amid geopolitical tensions. The iShares MSCI Frontier 100 ETF (FM) fell 1.70 percent Tuesday, bringing its YTD gains down to 25.60 percent but still outperformed the S&P by a wide margin. Now the question is whether recent weakness is a pause that refreshes or it’s a beginning of something worse? Below is an update look at a trade in FM. Our “U.S. Market Trading Map” painted FM bars in red (sell). After a strong run of outperformance since early 2016, FM peaked in late October, just above 32, and rolled over. This week’s downside follow-though confirmed the late October bearish signal and set the stage for a test of support around 30.50. That level is significant when FM climbed above it in early 2017. A close below that level on a weekly basis has measured move to 29. 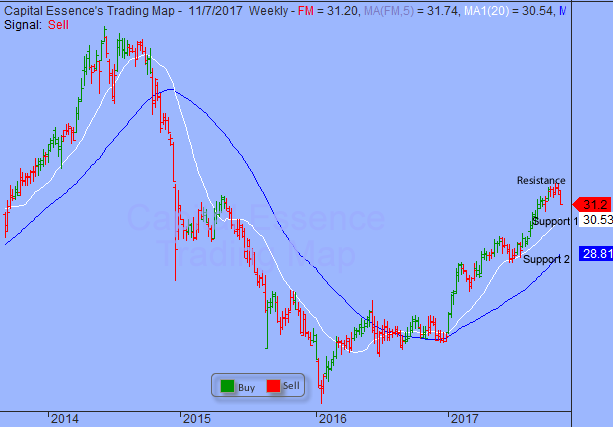 FM has resistance near 32. Short-term traders could use that level as the logical level to measure risk against. Short-term technical outlook remains neutral. Last changed October 30, 2017 from bearish (see area ‘A’ in the chart). S&P moved up to test resistance at the important sentiment 2600 zone. It traded as high as 2597 before sellers stepped in and pushed prices off the intraday high. In accordance to the Japanese candlestick pattern recognition, Tuesday’s spinning top indicated uncertainty. Technically speaking, when a spinning top forms after an upswing in the market, it can be an indication of a pending reversal, as the indecision in the market is representative of the buyers losing momentum. Perhaps the negative divergence exists on RSI, which peaked in mid-October and trending lower as prices ascending, is the best illustration of the bears’ case. Adding to concerns is overbought conditions. These elements suggested that risk is greater to the downside in the medium term. With this in mind, we’d look a trim positions into overbought strength. Short-term trading range: 2570 to 2610. S&P has minor support near 2570. A close below that level has measured move down 2528, based on the trend channel moving average. 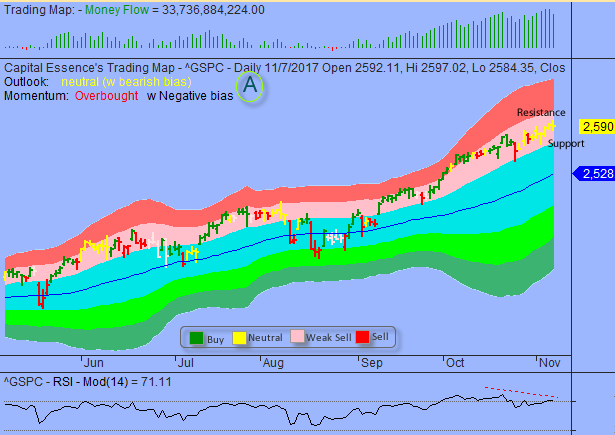 The lower boundary of the red band, around 2610, represents key price level. A close above that level often marked short-term market tops. Traders should put it on the trading radar. Long-term trading range: 2530 to 2630. Unless there is a headline that everyone recognizes as extremely positive or negative, expect S&P to swing within this 100 points range. Bottom line, the spinning top candlestick pattern in the S&P together with overbought conditions suggested that market is at or very close to a significant near-term top. Near-term risk is to the downside. Traders should consider buying downside protection on winning positions.